In an attempt to get ready for the Oscars this weekend, we decided to head over to a movie that had been on our "must-watch" list for a while. 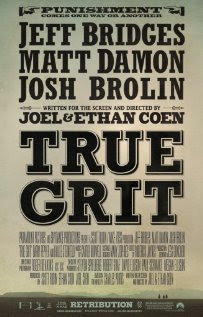 True Grit is a typical Coen brothers movie - one measure heart and one measure soul, and a whole lot of gorgeousness in between. The movie is a classic Western, sans cowboys and saloons. It is also a remake of a 1969 classic by the same name. In a sense the story of True Grit has been told before - several times over. There is no dearth of vengeful movies set in the wild west. But True Grit is a story not from the point of view of the hero or the villain, but from the perspective of a plucky 14-year old girl, who decides to avenge the death of her father. Mattie Ross (Hailee Steinfeld), plays the 14-year old, who upon learning of the death of her father in the hands of an outlaw Tom Chaney (Josh Brolin), takes it upon herself to seek revenge. She tracks down and employs a reluctant U.S. Marshall - Rooster Cockburn (Jeff Bridges), then to the latter's utter dismay follows him on the hunt. They are joined in the pursuit by a Texas Ranger LaBoeuf (Matt Damon) who informs them of a price on Tom Chaney's head in his home state. The characters in the movie are cast flawlessly. Mattie Ross is perhaps the most endearing and cheer-worthy 14-year old in a long time. There is a sense of naive clarity about her, that hold indomitably through out the movie. The role for Rooster Cockburn and LaBoeuf is as much to protect the Matty's naivete as it was to hunt down any wrongdoers. No review of the movie would be complete without a talk about the dialogue. The words and dialects are, presumably, accurate for the time period, but that also makes following them a tad dense and difficult to follow. But the pace of the movie is leisurely enough that you are never worried that you are going to miss something significant. Movie remakes, especially those by non-standard directors, are fraught with danger. One need only look at King Kong, to realize how a remake could trample on the soul of the original. I have not seen the original, but this movie feels so perfectly natural that one cannot help but imagine that the original would in no way have been diminished by the remake. This is a Western. No two ways about it. From the horses, to the dialect, to the unkempt lawmen and the charming lawbreakers, it is a story from the wild-wild-west. But there is an unmistakable Coen brothers' stamp on it. Be prepared to not follow every dialogue, but everything else about the little girl's fight for justice will leave an indelible mark on your heart.